At last I’ve found a book that I really, really like. (!). It’s Willful Disregard by Lena Andersson, and I can’t remember how I found it, but I’m very glad that I did. I read it quickly because it’s a library book, and I’m at the end of summer semester, and so I’m busy grading, but also busy getting ready to hit the ground running, which is what I do every summer since adulthood and even now in order to escape my current city and state. (Gorgeous state. Currently insufferable.) So, I only had a week to read this thing. 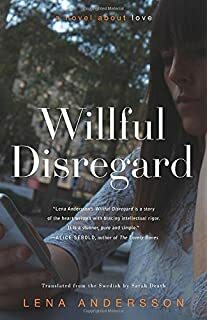 When I first learn of the title, I knew Willful Disregard was going to be my kind of novel. It is funny and smart and good in exactly the way that title is funny and smart and good. It’s the kind of book that makes me glad to learn that the author (Lena Andersson) exists in the world. It gave me hope for humanity. It’s funny, but it’s also devastating. It captures the analysis and the over analysis and the helplessness of unrequited love. It captures how long it takes. It captures the intense meaning read into every single event and adverb and sideways glance. You think you’re better and smarter than all of this, only to see (years later with the clarity of hindsight) that you were insane, that your precious friends and onlookers were gentle with your…willful disregard of all evidence and reality suggesting otherwise than your well laid plans, intentions, and interpretations. And even if you have been strong enough or numb enough to have never fallen into this type of stupid, full-body kind of love, you’ll probably still enjoy the deep insights into humanity, the smart philosophizing, along with mocking pretension that Andersson offers up in this novel. It’s her fifth book and first translated into English. With any luck, we’ll get more from her. This entry was posted in books, existentialism, life, love, nihlism, reading, relationships, Uncategorized and tagged book club, good books, lena andersson, movie review, swedish, translation, willful disregard on June 21, 2016 by sherewin. It’s so hard to find a good new book these days. So when I find one, I tend to spend as much time in it as possible. 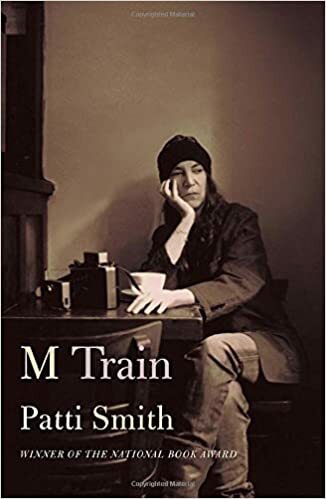 That’s what happened with Patti Smith’s new book, M Train. I read Just Kids a few years ago and loved it. In her rock and roll heyday (which is still now for many of us), Smith was known for brilliantly blending poetry with rock and roll. So it makes sense that she is a writer and also a fan of writing, which, in part, is what this book is about. It’s also about coffee. It’s about strange rituals and missions dreamed up by an amalgamation of literature, dreams, conversations and her own notions, which has her leaving stones at gravesites of people she knew or didn’t know, caring deeply about a small idea, about a small token, a small memory, a spirit. I’ve always identified deeply with Smith. Her dreamy, creative way of moving through the world is similar to me at my best self. On some existential level, I know the deep love she knew with Fred, and the deep loss, and the new existing in this strange world, but hers is deeper, more, and a guidepost for us all. I don’t know that I would like her. The day in/day out of her life seems sometimes boring, and dusty, and littered with cat hair, but there’s something about what she produces as an artist that opens me up, reminds me, shows me something new. So I stay in her books for as long as I can, and then hold on to them again afterward. This entry was posted in art, books, Uncategorized, writing and tagged book club, book review, feminine, just kids, m train, patti smith, rock and roll, spiritual on June 15, 2016 by sherewin. This entry was posted in garden, life, new year, Uncategorized and tagged coleus, columbine, Coreopsis, flowerbed, flowers, hope, hosta, lupine, phlox, potentilla, viola, yarrow on June 12, 2016 by sherewin.